Serious Factory will defend the French colours at CES Las Vegas from the 9th to the 12th of January 2018 on Paris Region Enterprise’s pavilion located in Eureka Park. This worldwide event is renowned for highlighting the innovative solutions of tomorrow and is the perfect occasion for Serious Factory to introduce its authoring software VTS Editor to the rest of the world. Its commitments: Being able to design a Serious Game the most efficient way possible without any graphical or technical competency. 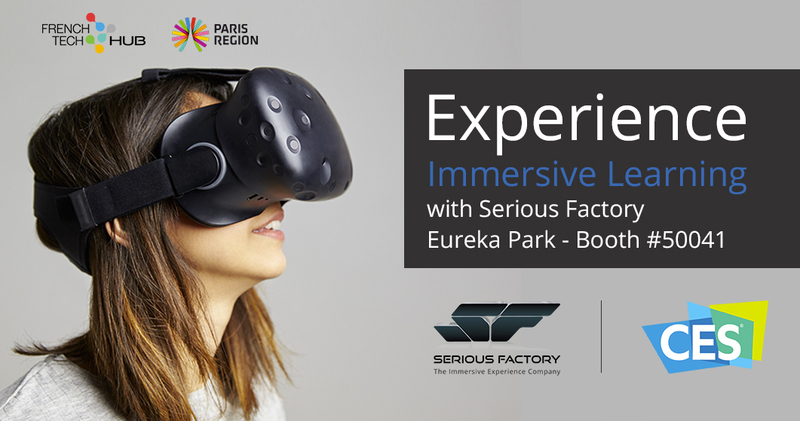 Supported by the French Tech Hub and Paris Region Enterprise, Serious Factory was elected worthy representative of the FrenchTech innovation and values at CES Las Vegas. The Immersive Learning Expert that we became will have the honour to exhibit its pedagogical solutions for this 2018th edition with its star product: The authoring software VTS Editor. For this CES, Serious Factory will have the pleasure to tell you all about its authoring software, a unique concept on the digital learning market. Easy to use, cost-effective and intuitive, this software allows you to create pedagogical and immersive scenarios without any technical or graphical competencies required. Creating a Serious Game has never been that easy thanks to a creation process inspired by Mind Mapping and a methodology close to Design Thinking. With VTS Editor, Serious Factory wants to democratize the art of Serious Game and the immersive approach of training by adding more interactivity, customizability and relevance inside training programs. Learners are indeed immerged inside concrete situations closest to their reality. This way, they can train and practice to develop their competencies and acquire automatisms. During the CES, Serious Factory will go even further by showcasing the ease to create a Virtual Reality version of a scenario. Discover in this video the entire process of creation: From the creative idea to the playable final version in a virtual reality helmet. Immersion granted! Serious Factory designs innovative solutions for professional training, to foster acquisition of skills. To meet the growing demand of “simulation” type educational devices, Serious Factory developed the authoring version of its Virtual Training SuiteTM software. Aimed at instructional designers, elearning project managers or training consultants, VTS EditorTM is an authoring software for Digital Learning, allowing to create virtual trainings, quickly and easily, all at low cost. With its intuitive graphic editing mode and easily configurable blocks, the designer can set up rich educational scenarios in record time, composed of scenes with realistic backgrounds and avatars with reactions that change in real time. The result is compatible with many platforms (PC, Mac, Windows, HTML) and meets the requirements of LMS via export to native SCORM. > 10/01/2017 - Serious Factory, engaging in tomorrow’s education with its authoring software!